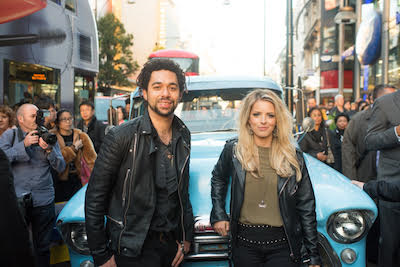 UK Country superstars, The Shires, surprised their fans and shoppers in central London today when they hitched a lift down Oxford Street on the back of a vintage American 1957 Chevy pick-up truck. Arriving in style, to celebrate the release of their new album 'My Universe' this week, Ben Earle & Crissie Rhodes were delighted to be performing to adoring crowds at HMV today, as their second album is currently shooting up the UK album charts, landing at No.3 in today's Midweek. ‘My Universe’ has already broken records by becoming the biggest-selling UK Country album in Week 1! The Shires of course hold the record for the biggest-selling UK Country album of all time, with their debut ‘Brave’ which has now gone Gold. The Shires stated: "We are thrilled to see such a fantastic reaction to the release of our second album this week! It's a very exciting time for UK country music. Thank you to all our fans for their support - it was wonderful to see you at HMV and we can't wait to get back out on the road next month for our next UK Headline Tour." Ben and Crissie travelled in true Nashville style, arriving on the back of the truck to greet fans waiting at the store to celebrate the release of the album. Once inside HMV, the audience was treated to a set of new material from the new record, that has so far been winning them praise, five star reviews and new fans… most recently Robbie Williams, after they gave his smash hit ‘Angels’ a UK Country makeover on Chris Evans‘ Radio 2 Breakfast Show. ‘My Universe‘ has been Album of the Week at BBC Radio 2, with the first two singles, ‘Beats To Your Rhythm‘ and ‘My Universe‘ both A-listed at the station, and added to the Magic Playlist.